I received some very encouraging news about our new Provision ProfitTime product, which we’ll be officially launching at the National Automobile Dealers Association (NADA) convention this week in San Francisco. The upshot: ProfitTime appears to be living up to its promise as a metric and methodology that can help dealers push back against margin compression, while increasing their sales volumes and gross profits. The take-away follows a survey we sent to dealers who’ve been using ProfitTime for the past several weeks. We asked dealers if they’d recommend ProfitTime to other, non-competing dealers and what observations they’d offer about their early ProfitTime experiences. On the first point, we found that dealers, overall, would recommend ProfitTime to other dealers. On a 1 -10 scale, with 10 representing the highest likelihood to make a recommendation, ProfitTime dealers offered an average score of eight, which suggests some satisfaction with their ProfitTime experience so far. To be sure, the feedback comes from early adopter dealers. They are typically more receptive and willing to make changes to their dealership operations than their peers. Still, I’m encouraged by the early reviews. They suggest that ProfitTime’s reception will be positive at NADA. I’m off to the airport, and look forward to meeting dealers and friends at the vAuto booth (#1620S). Safe travels if you’re going to NADA, and I hope to see you there. Getting my PT demo tomorrow. Can’t wait! Dale Pollak believes the car business is at a critical crossroads. 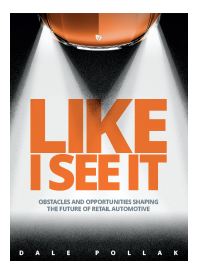 Like I See It offers a unique perspective and practical solutions to help dealers, OEMs and solutions providers ensure a viable and profitable future. Buy All Of Dale’s Books!